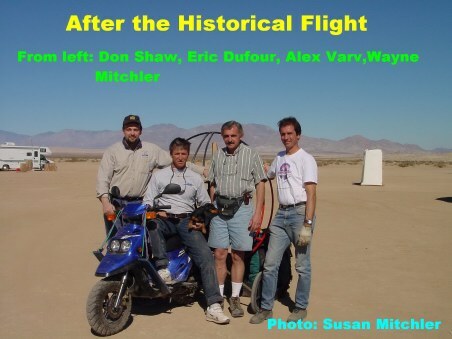 All of what we are just about to present, took place after the Ocotillo Wells PPG Fly-in, held between February 01-03 2002, in the middle of the desert in California. After the event ended, a few participants decided to stay for the biggest PPG fun they have ever had. But that is another long story. The object: a new Para-Scooter as I called it or The Ultralight Scooter how the inventor, Don Shaw named it. is a true inventor and visionary. He has worked on many projects for certain government agencies, some of them futuristic and some very real. It was really hard to get more information about his other present or past activities, except that he told me they involve "Mankind's Mobility in the Air, Sea and Space". Some time ago, Don Shaw decided to design and build a new type of extremely portable "ultralight vehicle" that would have a double propulsion system: one for ground traveling and another one for flying. 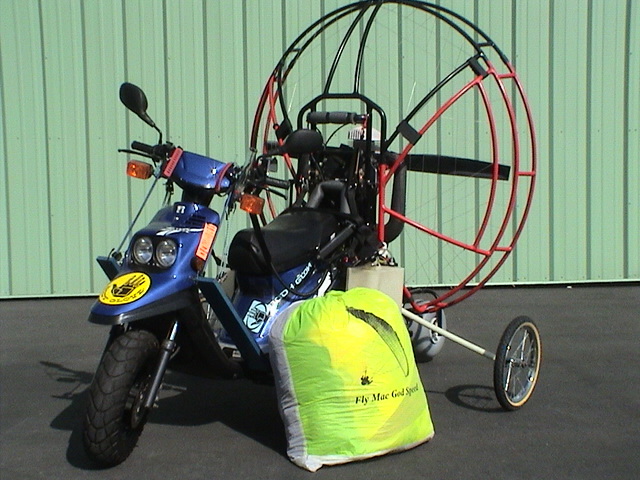 The result is a scooter with a paramotor on the back, two additional side wheels and a paraglider....the Ultralight Scooter, the "Flying Scooter" or the Para-Scooter. So here we are, in the middle of nowhere, surrounded by sand and mountains when we noticed a few gentlemen pushing a strange vehicle on the sand: a scooter in every sense but with a paramotor on it. At first, Bruce Brown, from Ohio Powered Paragliding, Mo Sheldon and Andy Mc Avin of Texas Flysports even laughed. A "broken scooter" with a paramotor was pushed by a few people. 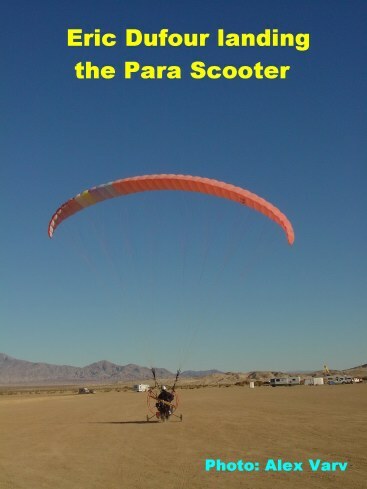 I even asked: "Why are they pushing that scooter instead of taking off the paramotor and carrying it since the scooter is broken?" Very soon we found out why, when we noticed a paraglider being unfurled and attached to the scooter. This was enough for us. We ran the few hundred yards in a few seconds. We could feel that something very unusual was happening. Getting closer, I saw Eric Dufour of Paratour Canada (www.paratour.com) a well known PPG pilot and instructor. Immediately, a strange feeling crossed me: they were just about to fly this unfamiliar object. Noticing my amazement, someone told me they were only trying to taxi and test its behavior on the ground. 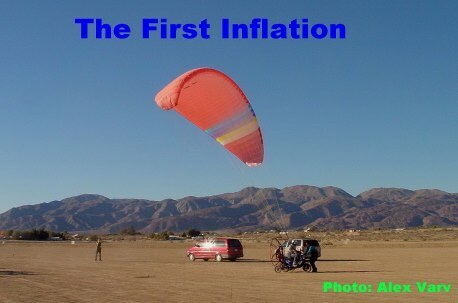 After the first successful inflation with assistance, I heard they were ready for the next test. 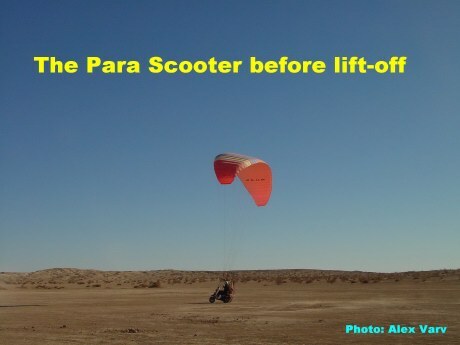 Indeed, once set up, the scooter's engine came into life and soon the paramotor's engine roared-up as well. Wayne was at the controls. 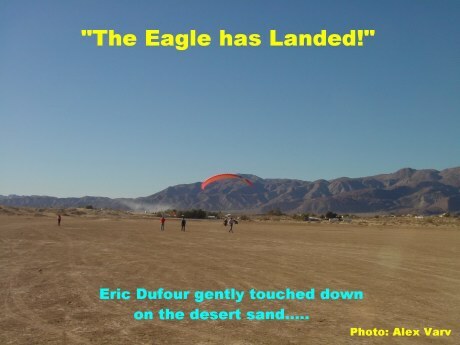 He brought up the wing, added power and the vehicle began taxiing down the sand. After a few more trials, Don Shaw, the inventor, seemed to adjust different things on this unusual machine. Then Eric Dufour "mounted" the vehicle. The first taxi was not perfect. I could see how this pilot tried to feel the machine. 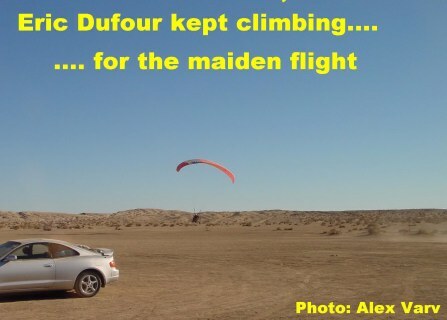 A long time ago, after instructing me briefly, Eric Dufour said:"Alex, the paraglider is like a horse. If you can not control it, do not fly it. Leave it on the ground"
This was exactly what he was doing and with good results, I must add. The next taxiing was much better and the third one was just perfect. He was able to control the machine all the time even doing turns on the sand. 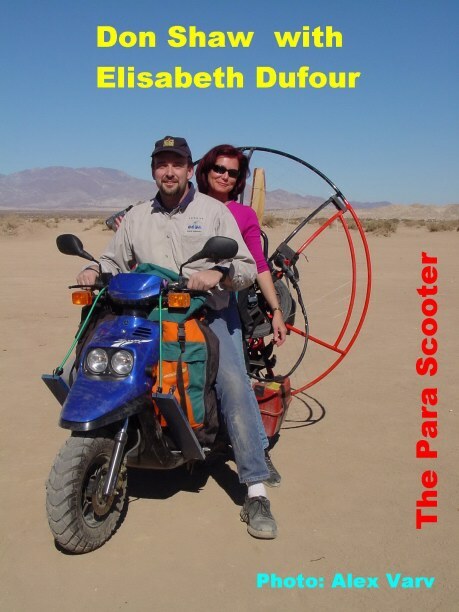 Eric had a difficult task: he had two throttles (one for the scooter and one for the paramotor) and he also had to steer the wing. In no time, he was ready. Don Shaw asked him: "Are you ready to simulate a take off?" Eric replied with a humble but strong voice: "I am." He inflated the wing added power and the vehicle began its well controlled roll..
Clouds of desert dust were left behind the machine. It was an unforgettable sight. But sure enough, as if this were a command, the vehicle lifted-off. Perfectly balanced, the scooter entered a very shallow climb. I could see how Eric Dufour was carefully testing this machine. We could see every step of a well planned action. There were no sudden movements. Flying low, in case of an engine out, he could land easily. Eric kept flying level and straight for a while and then initiated a very shallow left turn. From the distance, it seemed that "the horse" had been tamed. The wing was obediently responding to his inputs. In a few minutes, we all saw how Eric went one step further. His turns become steeper and the machine, like before, was following his will. Soon Eric had completed the turn and was gaining altitude. He flew straight above our heads. I heard cheers behind me while aiming my camera at the Scooter. Mo Sheldon was also taking pictures with his digital camera. So was Bruce Brown. More pictures of this flight can be seen at http://www.cyberarch.com/ppg in: "The February 1-5 Adventure"
Eric Dufour flew a few more turns and by the minute, our confidence in his flight grew. After a while, he turned into the wind again and started to descend. "Final approach" somebody shouted with excitement. Indeed, out test pilot was loosing altitude but at a very slow rate. He was carefully planning his next step: landing the Para-Scooter. It was a textbook landing. After touch down Eric kept rolling. Cheers exploded from everyone. Eric "dismounted the horse", took off his helmet and just said:" I am hungry! Let's have breakfast." I asked: "How could you do this so flawlessly?" He answered with a natural voice: "I had flown this in my head for several years". This was an unforgettable morning. I approached Don Shaw : "How do you feel ?" He exclaimed: "I can not believe this. "Today, we made history!" They certainly did but what impressed me most, was their attitude. After a brief conversation with Don Shaw, I learned that he intends to further develop this prototype. 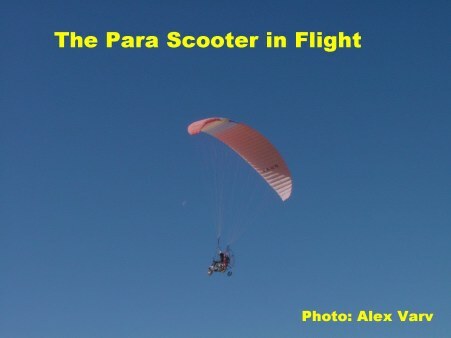 The goal is to achieve a perfectly legal scooter that can carry the paramotor, pilot and the wing from home to the launch site on public roads. The two side wheels are collapsible and the vehicle is perfectly legal on the roads. Is this futuristic machine a reality? 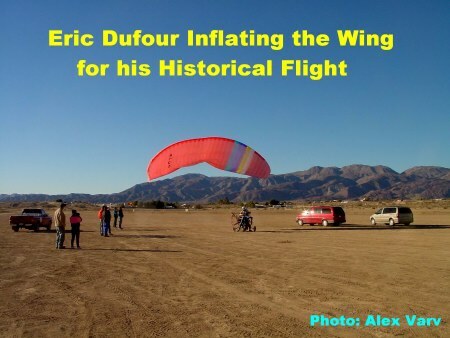 Any additional pictures about this historical flight are welcome. I have just received two other interesting links on this subject . Please, check them out as well. 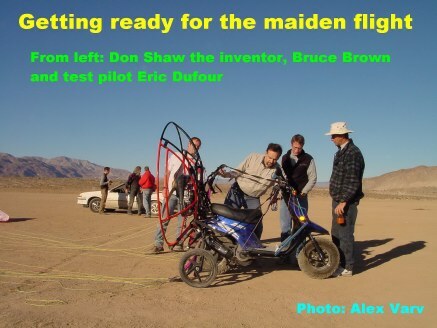 We have just found out that since the historic flight, Don Shaw has perfected his invention. More updates to be published when available.